ExHiBiTiON Institutional dissonance Tate Britain, BP and Socialist–Feminist HistoryDave Beech’s review of Tate Liverpool’s exhibition Art Turning Left: How Values Changed Making 1789–2013 (‘A Blockbuster for the Left’, RP 184) assessed the usefulness of the exhibition form for presenting the complex histories of left-wing politics and their intersections within art practice. Two concurrent exhibitions at Tate Britain (16 September 2013–6 April 2014) raised comparable questions about the historicization and display of politically informed art within the contemporary museum, in relation to feminism. Situated adjacent to the primary circuit of Tate Britain’s new BP Walk through British Art, BP Spotlight comprises ‘a series of regularly changing collection displays which … offer more depth on specific artists or themes or highlight new research’. In Sylvia Pankhurst, attention was focused on the political campaigner’s often-overlooked art practice, while the neighbouring exhibition displayed the collaboratively produced Women and Work: A Document on the Division of Labour, from 1975. Demonstrating a clear interest in the ‘specific theme’ of women and labour, the foremost concern to arise is: why is Tate showing this art now? The imperative of situating the works within the (past) socio-economic conditions of their production, whilst reflecting on the (present) contexts of their display, can generate unsettling questions for the constantly renewed relationship between feminism and the art institution. The powerful dissonance between these artworks and their display in Tate Britain offers a heightened illustration of ongoing debates about the role of institutions and exhibition practices in consolidating art’s history in the twenty-first century. The place of formerly ‘marginal’ art histories in this process (here, feminist one) invites reflection upon the relations of such histories to the institutions that they have belatedly come to empower through their appearance within them. The Great Feminist Revival (as insistently promoted by the Guardian newspaper, among others) has not bypassed the art world. Contributors to a roundtable discussion published in Grey Room labelled 2007 ‘the year of feminism’, while Amelia Jones noted that ‘feminism has returned with a vengeance to the art world.’  A series of prestigious survey exhibitions have acted as shorthand to indicate some sort of institutional change, or at least institutional recognition, for the history of what is increasingly known as ‘Feminist Art’. A rhetoric of return echoes across contemporary feminism. It is a tendency that has been driven, Jones argues, by an optimistic attempt to re-engage ‘a loosely defined movement that we at least fantasize as offering the most effective institutional and visual strategies in countering … nefarious structures of power’. It is not, however, entirely straightforward for younger artists, writers and curators to extend the political efficacy they perceive in second-wave histories; consequently, feminism risks devolving into a common-sense ideology when major institutions decontextualize and reframe its past. Art historians have generally been sceptical about the promise of conventional curatorial methods to represent political histories. If feminism and Marxism raise the question of ‘extra-academic interests and values’,  extrinsic to conventional institutional boundaries, then recouping these artworks has profound consequences for the meanings produced in the exhibition space. Recently, museums have appeared increasingly eager to align themselves with the subversively ‘extra-academic’, adopting what Julian Stallabrass terms a ‘corporate rhetoric of nonconformity’. Yet such an ‘incorporative approach’ is in danger of leaving the status quo fundamentally unchanged. This general condition of feminist revival, one that employs earlier strategies without a corresponding renewal of politics, must be borne in mind when considering Tate’s BP Spotlight displays. An obvious concern is that the insistent rhetoric of return, and the attendant inclusion of particular art practices (within a limited curatorial frame), function to simultaneously disguise the failure of oppositional politics to avoid recuperation within the unchanged institutions they sought to criticize and revolutionize. The 1980s was a period of rapid expansion for Tate, as it opened new museum sites and turned increasingly to private investment. At the time, Deborah Cherry and Griselda Pollock condemned the museum’s relationship with financier Pearson, indicting its ‘practice of legitimating corporate capital by cultural patronage’. The hastening incursion of corporate finance into semi-public cultural institutions has of course received much attention in the intervening years. Tate’s controversial 1990 sponsorship deal with BP has been especially prominent. As the arts group Platform put it in 2012: Tate ‘once again faced criticism for taking money from a company now known as the third most responsible for climate change in the world, as well as causing much local environmental damage and human rights abuses’. Almost exactly mirroring Cherry and Pollock’s comment from thirty years earlier, they added: ‘Campaigners assert that by taking money from BP the Tate is contributing significantly to the company’s “social licence to operate”.’  However, beyond merely legitimating corporate operations, again as Cherry and Pollock pointed out, such cultural practices ‘also sell meanings’. The recent museological turn to the extra-institutional art histories informed by (socialist) feminism does not simply reflect pre-existing formations, but is actively ‘determining an art historical category of “Feminist Art” or “Art by Women”’. The jarringly visible corporate branding of Tate is not discountable from this production. In both exhibitions, the clash between the political intentions of the subjects (Pankhurst; Harrison, Hunt and Kelly; the Emily Davison Lodge) and the mediation of the host institution (Tate and BP) – between the feminist intent to expand the boundaries of art into the socio-economic arena and the museum-gallery’s homogenizing viewing conditions – represent irresolvable opposing interests. The Pankhurst exhibition was curated by Emma Chambers in collaboration with the artists’ collective The Emily Davison Lodge. A letter from the collective to Tate Britain is included, beseeching the museum to consider the importance of collecting Pankhurst’s work and ‘promoting her significance to the nation’. As is well known, Sylvia was born to the political Pankhurst family and, alongside her mother and sister, agitated for women’s suffrage. However, unlike Emmeline and Christabel, she left the Women’s Social and Political Union (WSPU) in 1913 to set up the East London Federation of Suffragettes, which later became the Workers’ Socialist Federation. This change of title reflects Pankhurst’s expansive political approach, which during this period encompassed workers’ rights and anti-imperialist struggles. However, as the Emily Davison Lodge points out, she was also a talented artist. The BP Spotlight exhibition contains examples of her WPSU designs, alongside a 1907 series of drawings and paintings made on a tour of factory towns across Northern England and Scotland. These images of coal workers, boot makers and cotton mill labourers were originally produced as illustrations for a lengthy critical article entitled ‘Women Workers of England’, published in London Magazine in November 1908. The illustrations also accompanied a series of shorter essays published in Votes for Women magazine between 1908 and 1911. A concerted effort was made, through the inclusion of information panels, to communicate these contextual details to the audience; to emphasize the original function of Pankhurst’s images as illustrative evidence for her reports on gendered wage discrepancy and poor working conditions. To this end, a facsimile of the ‘Women Workers’ article is also included in the display. However, the conventional organization of the exhibition secures an idealist narrative in which the artist-function ‘Sylvia Pankhurst’ is established at the beginning of the display with a large-scale studio photograph. The privileged space of the studio functions to frame the painter as exceptional genius, positioned, in particular, above and beyond her working-class subjects, whose daily lives she translates for an educated, metropolitan audience. In this instance, the invocation of ‘art’ retrieves Pankhurst’s socialist activism only for art history. This romantic hierarchy is further reinforced since the exhibition was at the behest of two artists. Curated by Katherine Stout and (again) Emma Chambers, the BP Spotlight display contains selections from Women and Work: A Document on the Division of Labour. This conceptual project was produced collaboratively by Margaret Harrison, Kay Hunt and Mary Kelly between 1973 and 1975 and documents the division of labour at a metal box factory in Bermondsey, South London. Comprising statistics, interviews and photographic evidence, the archive particularly draws attention to the disparate pay and promotional opportunities between men and women at the factory, and how these were affected by the 1970 Equal Pay Act. Unlike Pankhurst’s illustrations, made over a century ago – the radical context of which is largely suppressed in their formal accordance with modern ideals of art and its aesthetics – the adjacent exhibition is starkly non-visual. The archival documents present a pseudo-sociological study of the factory and thus create doubt about what counts as art and why; what counts as work and why. As Michèle Barrett has reminded us, art is generally seen as ‘the antithesis of work. It is mythologized as an oasis of creativity in the desert of alienated mass-production capitalism. It is idealized as the inspired product of a few gifted and privileged people.’  The museum display of this documentation, produced from the seemingly un-artistic space of the factory, could therefore be understood to destabilize this division. The documents comprise videos demonstrating the daily processes of the factory, photographs of the repetitive tasks, and tallies of the men and women employed in each job. The exhibition is, dare I say, fairly dull – as one photocopied booklet on ‘management theory on productivity’ attests. However, is this not the point? The items record the dull and monotonous work of the factory and refuse the aesthetic conceits of art. Unlike later relational or dialogical gallery ‘experiences’, Women and Work does not seek to entertain; instead it starkly (re)presents the workers’ daily experiences for its audience. In the original exhibition, however, the collective stressed the importance of location, stating that the ‘Bermondsey area of Southwark has been the centre of workshop industries employing large numbers of women for over a century.’  Thus the rationale of the art project is locally embedded and inextricable from the social history of the area, which Wom en and Work, instalation, South London galery, 1975either ‘think’ or simply imagine the future seems structurally linked with the enthusiasm shared by so many artists for digging up various obscure odds and ends…14 According to this argument, the indulgently nostalgic archival strategies of many contemporary artists fail to have critical effects in the present. The question that we run up against time and time again is whether this homogenizing nostalgia is an inevitable outcome of the exhibition form. prompts particular concerns when it is relocated in the atemporal space of Tate Britain. 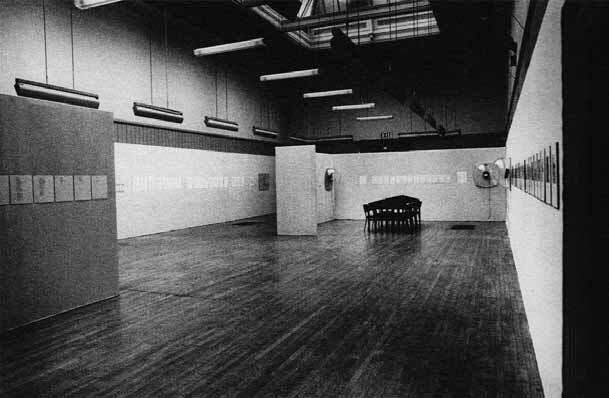 In 1975, after being banned from the metal box factory, the artists exhibited their project in the nearby South London Art Gallery. As Rosalind Delmar wrote at the time: ‘it is the fact that the photographs, interviews, tables and charts are contained in a particular mode within the gallery that makes them into “art”.’  It is difficult to assess how close the curatorial set-up at the Tate is to the original show, but Delmar mentions the ‘amplified sound’ of the videos, ‘the sounds of the factory, the whirring, booming and clanging of the machines’. These sounds (which, according to Delmar, suggest ‘the flesh and blood of the process’) are notably absent from the Tate Spotlight display, reinforcing the sterile gallery atmosphere and negating the original attempt to produce an immersive aural disquiet that mimics the worker’s daily environment. Reviews from the period report that the archive would – after an immediate tour of Trades Council spaces – be housed in Manchester’s Museum of Labour History. However, in 1996 curator Judith Mastai reported that the museum had no knowledge of the artwork and she had discovered that it was in fact being stored in Kay Hunt’s attic. The history of the project’s display is therefore anything but straightforward. Having been recovered by Mastai and shown in Vancouver in 1997, part of it appeared in the 2000 Whitechapel Gallery show Live in Your Head, Concept and Experiment in Britain, 1965–1975, curated by Clive Phillpoyt and Andrea Tarsia. Formally related to the documentary practice of Mary Kelly’s Post-Partum Document (1973–79), which she was working on at the same time, it is the context of the history of Kelly’s pioneering practice that the piece has so far largely been discussed. Its acquisition by the Tate could therefore be considered as fulfilling an important archiving and preservation function. However, in shifting from factory, trade hall and small gallery, through domestic storage to the museum, the work’s character changes significantly and the impact of this evolving framework needs to be made visible to audiences, if its historical, political and artistic meanings are to be preserved along with its physical materials. Women and Work collects and presents a wealth of information about gender, hourly wages, promotional opportunities and the daily routines of workers. The politicizing or educative effects that these materials may have had upon a contemporaneous audience viewing them in a 1970s’ union hall can be difficult to imagine. Diary-style entries chart the working day of employees: for example, women who had to balance domestic duties (making packed lunches and dinners for sons and husbands) with evening factory shifts. These objects imply the inextricability between the politics of employment and the sexual division of work in the family home. Reading the diary entries it is incredibly difficult for a younger generation to reconstruct the economic and sexual relations that structured these workers’ lives. It is a working day and domestic routine that demands further clarification. Presented as ‘art’, framed and hung on the gallery wall, these documents risk slipping into a remote irrelevancy. The art produced by Sylvia Pankhurst and the Women and Work collective offered reasonable and thoughtful critiques of the situation as it existed at their respective historical moment. But, following Coole’s suggestions, do we not urgently require new information, new theorizing and new practices? The curation and exhibition of artworks need to be a mode of research, one method of indicating the direction of new paradigms, rather than offering a display of art’s fixed historical moments. Although the inclusion of this material may produce an expansion in the museum’s understanding of ‘art’, it nonetheless here fails to trouble the category itself – and, of course, understanding why art might be (or have been) a more privileged form of work than bootor boxmaking is fundamental to this. The cultural baggage that occludes and mystifies the historically distant labour represented by the artwork is not challenged by the Tate displays. Instead, nostalgia works to secure these moments as remote and obscure. Separating them out, the displays enact a politics of information rather than knowledge, ideals rather than ideas. As with any exhibition of historical works, an anlysis must be addressed to the historical conditions of the present discourse on these practices and the ways in which their institutional representation is implicated in current processes of social control. Arguably, at a time when Tate’s reliance upon corporate sponsorship is more visible than ever, the museum has adopted the impression of inclusivity and auto-critique. A significant moment of institutional dissonance is provided by these two exhibitions, which force us to rethink feminism’s cultural alliances and strategies. Both of these archives were born out of socialist-feminist struggles in the twentieth century. Tate Britain’s conservative curatorial framing of them within BP-sponsored exhibition spaces, serves to make a mockery of these struggles, to signal their presumed failure and to mark a cynical recuperation by the very capitalist forces they set out to oppose. 1. ^ www.tate.org.uk/whats-on/tate-britain/exhibitionseries/bp-spotlights.Infact [archive], these are not strictly ‘col ection displays’. Pankhurst’s work was on loan from other institutions. 3. ^ The most notable exhibitions include: Wack! Art and the Feminism Revolution (Museum of Contemporary Art, Los Angeles, 4 March–16 July 2007); el es@centrepompidou (Pompidou Centre, Paris, 27 May 2009–21 February 2011); Global Feminisms (Brooklyn Museum, New York, 23 March– 1 July 2007); Kiss Kiss Bang Bang (Museo de Bel as Artes de Bilbao, 11 June–9 September 2007). 4. ^ Jones, ‘1970/2007: The Return of Feminist Art’. 5. ^ Jonathan Harris, ‘Review: Donald Preziosi, Rethinking Art History’, British Journal of Aesthetics, vol. 30, no. 4, 1990, pp. 384–6. 6. ^ Julian Stal abrass, Art Monthly 286, May 2005, pp. 1–4. Museum Survey Shows Since 2005’, Anglo-Saxonica, vol. 3, no. 6, 2013, pp. 129–51, 135. 8. ^ Deborah Cherry and Griselda Pol ock, ‘Patriarchal Power and the Pre-Raphaelites’, Art History, vol. 7, no. 4, December 1984, pp. 480–95, 481. 10. ^ Cherry and Pol ock, ‘Patriarchal Power and the PreRaphaelites’, p. 481. 13. ^ Lisa Tickner, ‘Modernist Art History: The Chal enge of Feminism’ (1988) in Hilary Robinson, ed., Feminism–Art– Theory: An Anthology 1968–2000, Wiley–Blackwell, Oxford, 2001, pp. 252–3. 14. ^ Dieter Roelstraete, ‘After the Historiographic Turn: Current Findings’, e-flux journal 6, May 2009. 15. Michèle Barrett, ‘Feminism and the Definition of Cultural Politics’, in Robinson, ed., Feminism–Art–Theory, p. 309. 16. ^ Margaret Harrison, Kay Hunt and Mary Kel y, ‘Women and Work: A Document on the Division of Labour in Industry 1973–75’, in Judith Mastai, ed., Social Process/Collaborative Action, 1970–1975, Charles H. Scott Gal ery, Vancouver, 1997, p. 80. 17. ^ Rosalind Delmar, ‘Women and Work’, Spare Rib 40, 1975; repr. in Griselda Pollock and Rozsika Parker, Framing Feminism: Art and the Women’s Movement 1970–1985, Pandora Press, New York, 1987, p. 201. 18. ^ In September 1975, it was shown by Hackney Trades Council, and in November Brighton Trades Council arranged a display at Brighton Polytechnic. See Mastai, ed., Social Process/Collaborative Action, p. 11. 20. ^ Diane Coole, ‘Feminism without Nostalgia’, Radical Philosophy 83, May/June 1997, p. 21.